TEACHING SCIENCE AT THINK Global School comes with a distinct advantage not found at most other ‎high ‎schools: holding courses in a different country each term allows our teachers to turn their ‎surrounding ‎environments into lush organic classrooms. Lessons are often held outdoors amidst ‎expansive foliage or ‎underwater.‎ By spending time in delicate ecosystems such as the Galapagos Islands and Iguazú Falls, our teachers are able to better impart onto students the dangers of global warming and pollution through experiential learning. Few are more outspoken about the dangers posed to our environment these days than former Vice President of the United States Al Gore. Winner of a Nobel Peace Prize in 2007 for his work on climate change, Gore’s book (and subsequent documentary film) An Inconvenient Truth has received both acclaim and criticism since its release. It was this topic of climate change that brought a select group of THINK Global School students and teachers to Harvard University recently. As part of the Paul R. Epstein Memorial Lecture Series, Gore held a talk entitled “Healthy Planet, Healthy People”, in which he stated that the consequences of global warming are nothing short of calamitous, but that he still believes in humanity’s ability to change for the better. In his talk, Gore also expressed his disappointment in the U.S. political system’s general ambivalence towards global warming but held out hope for President Obama in his second term. After returning back to their dorms, the students that attended were asked to provide a written assessment of Mr. Gore’s speech. Their responses were spirited and insightful, and links to a selection of these writings can be found below. 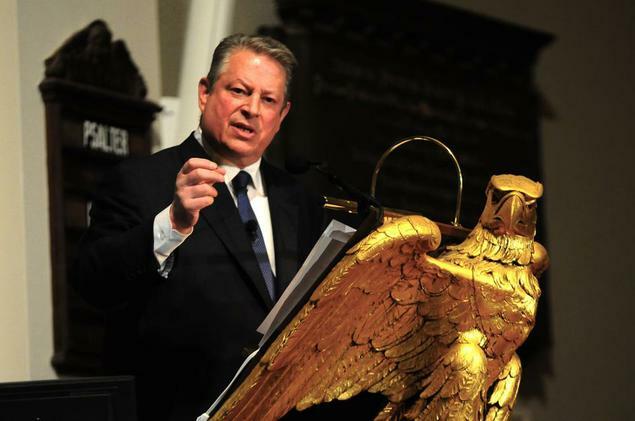 Also included is a trailer for the film adaptation of Mr. Gore’s An Inconvenient Truth. Green is the new crimson by Maya M.
The dots connect, very powerfully by Megan K.